Meet School Teacher Urvashi Yadav Who Started a Chhola Kulcha Thela to Save Her Family From a Cash Crunch! All those women out there, if you think all your years of homemaking have left you good for no financial opportunities, and that the kitchen is the only place you can work, our (Gurugram) survivor lady shows just how to pull the kitchen onto the road, turn cooking skills into a boon and tell you that you are worth the world! As early as the month of May this year, all this would have made no sense to Urvashi herself, who now owns a stall in Sector 14 and sells Chhole Kulche like a braveheart! Belonging to a South Delhi family of the hordes of SUVs and a 300 sq. feet yard home, the skies fell on her one dismal evening when her husband met with an accident and broke his leg. Doctors suggested hip replacement for her husband, and life suggested something else for her. Fearing a financial crunch likely to sink the family and her children’s education following the withdrawal of the income of the breadwinner of the family, Urvashi decided to save her family by doing what she did the best - cooking! And here she comes with her thela, serving food with the same smile and love every day amidst the very streets of the town where perhaps she was a customer of just such thelas some months ago. Supporting her husband’s income as a nursery teacher as she previously used to, quitting the teaching job to come onto the roads wasn’t something that came easy to her. Her father-in-law and children were unhappy with the idea, as it did not hold up to their standards, who rather suggested she open a shop. But what if it did not work?, she thought. Refusing to get dragged into deeper financial burden by taking help from her in-laws and opening up a shop she wasn’t sure would work, she stayed with her decision to open a basic stall that her salary was enough to afford. Standing there inspiring every woman that passes by, her stall is now a hit in the area, serving deliciousness like never before! 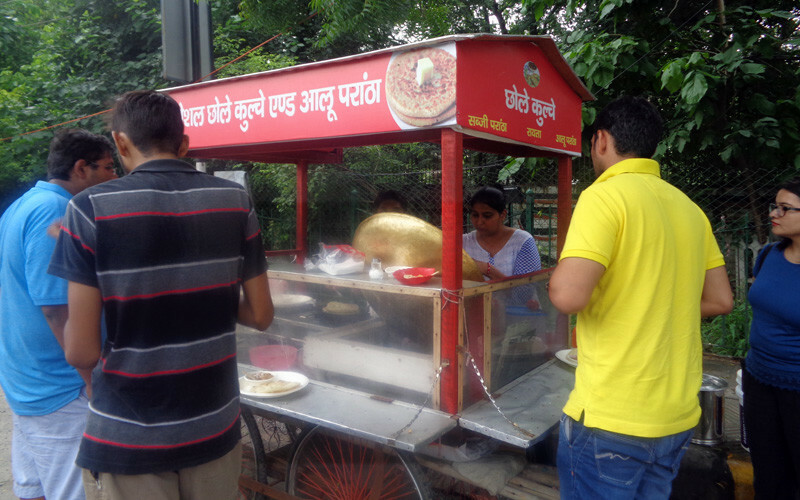 Buttery pieces of hot steaming kulchas, served with scrumptious-looking chholas topped with salad and sprinkled with some love - that&apos;s what you&apos;ll be served if you cross by the Sector 14 main road along the opposite side of Gulaab Sweets. We were salivating even before our plate was ready, for the compelling aroma and the sizzling buzz of the food wouldn’t let us wait in peace! 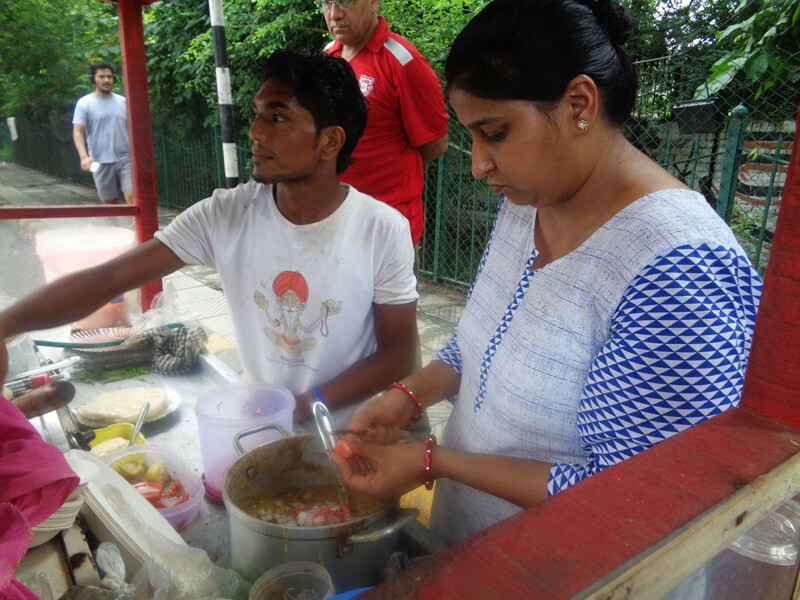 We were told that unlike the usual perception about street food, Urvashi strictly maintains proper hygienic while preparing her plate, and ensures the ingredients are fresh and healthy. 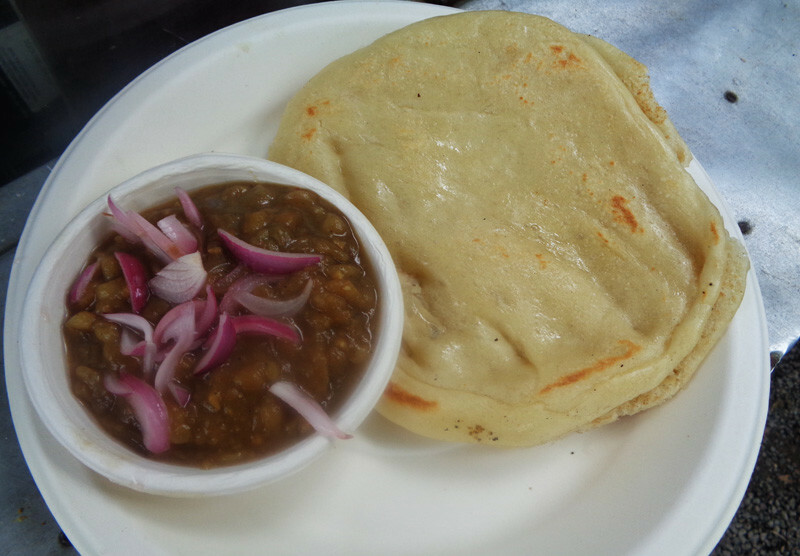 Imagine a life of walking on carpets and sleeping under the AC all night, and then one day suddenly you find yourself at a roadside stall selling chhola kulchas under the scorching sun all day. She almost broke down the first day of her stall, and tells us how embarrassed she felt. But her determination did not flinch from the harsh, hard work. Urvashi wasn’t the type who could bear the heat of the sun tearing her skin, as she tells us, but she wouldn’t move from her stall. Even her father-in-law had assumed that she would shut the stall by the seventh day, and that all her determination was just an exaggerated excitement that would die out. With pride in her eyes and gratitude in her smile, she tells us how he himself came out to extend all the help she needed when she refused to deter and continue with the stall week after week. Having begun the road not taken, one fine day when everybody on Facebook started talking about her, she was so overwhelmed she remembers how even her family started taking pride in what she does. With all the money that she saves from the stall today, she dreams of opening her own restaurant soon. We wish you all the success in the world Urvashi, and would love to dine in your amazing (we know that already) restaurant one of these days!